Michael E. Norton is the son of Jimmy and Deborah Norton of Holly, MI. He is a graduate of West Highland Christian Academy where he participated in basketball, soccer, and was named the salutatorian. Norton joined the U.S. Army from his hometown of Pensacola, FL, after his high school graduation in June 2004. After attending One Station Unit Training, the Basic Airborne Course, and the 75th Ranger Regiment Indoctrination Program at Fort Benning, GA, he attended and graduated from the US Army Ranger School. 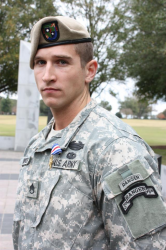 He was then assigned to 3rd Battalion, 75th Ranger Regiment, Fort Benning, as a Grenadier. He has since filled the roles of Rifleman, SAW gunner, Machine Gun Team Leader, Team Leader, and is currently a Squad Leader. Michael has deployed four times in support of Operation Iraqi Freedom and twice in support of Operation Enduring Freedom. On 4 and 5 August 2009, Sergeant Norton led his squad on an objective to raid an enemy combatant's headquarters camp in the mountains of northwestern Khowst Province, Afghanistan. Behind the first enemy rocket-propelled grenade team, a medium machine gun on elevated ground to the northwest engaged them with highly effective fire. Two more enemy combatants were on the slope of the valley to the west, and engaged the Ranger squad with an AK-47 and rocket-propelled grenades along the long axis of their formation, while another group of enemy fighters were on elevated terrain to the east, and raked them with small arms fire from the rear of the Ranger squad formation. "The example of personal courage that Staff Sgt. Norton showed, to get his men out of the kill zone is a testament to his character," said Maj. Keith Carter, A Company, Commander. "NCOs such as Staff Sgt. Norton are the reason I wanted to serve in the 75th Ranger Regiment, and it is an honor to lead them." "I'm proud of the actions of my squad, because we continued the mission after that," said Norton. "It was just two minutes out of our overall mission." "Any Ranger would have done the same thing," Norton said. "The Ranger Creed says, 'I will never leave a fallen comrade.' There was no moment of thinking about what to do. I had to get my brothers and the most important thing in my mind was how hurt they were." As his platoon fought off the enemy ambush with direct fire, mortars and close air support, Norton quickly assessed his casualties and reorganized his squad to return to the fight. Norton continued leading his squad in the follow-on assaults through two more direct fire contacts, killing two enemy combatants. "We receive a lot of great training here at 3rd Ranger Battalion and I was just acting on instinct," said Norton. The training conducted by Rangers means everything on the battlefield. "The goal of the company and battalion is to create the most realistic scenarios possible while minimizing risk," said Carter. "We constantly integrate new enemy tactics from overseas into our training so that we are ready in any situation." 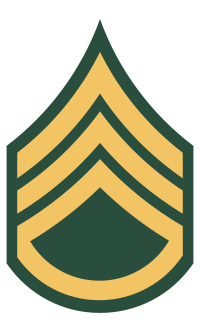 For his actions, Sergeant Norton received the Silver Star Medal and, on 1 September 2009, he was promoted to the rank of Staff Sergeant. The President of the United States of America, authorized by Act of Congress July 9, 1918, takes pleasure in presenting the Silver Star to Staff Sergeant Michael E. Norton, United States Army, for for gallantry action while serving with the 3d Battalion, 7th Ranger Regiment, in action from 4 to 5 August 2009 during combat operations against an armed enemy of the United States as a Ranger Rifle Squad Leader for Joint Task Force in support of Operation Enduring Freedom. Sergeant Norton led an assault on a heavily armed fighter camp in the mountains of Afghanistan. Ambushed at close range, Sergeant Norton ordered his squad to break contact. At great risk to his own life, he then braved multiple rocket-propelled grenades and withering machine gun fire to return to recover two of his Rangers who lay unconscious in the beaten zone of enemy fire, saving their lives. He then rallied his squad and continued the attack, eliminating two more enemy combatants in the course of the mission. His actions saved the lives of his squad and resulted in the destruction of an enemy headquarters camp. Sergeant Norton's distinctive accomplishments are in keeping with the finest traditions of the military service and reflect great credit upon himself, this command, and the United States Army. Narrative to Accompany Award: Sergeant Michael E. Norton distinguished himself through exceptionally valorous achievement from 4 to 5 August 2009 while deployed to Afghanistan in support of Operation Enduring Freedom while serving as a Ranger Rifle Squad Leader. On 4 and 5 August, Sergeant Norton led his squad on an objective to raid a known enemy combatant's headquarters camp in the mountains of northwestern Khowst Province. Sergeant Norton was on his fourth mission as a squad leader, assuming these duties when his squad leader redeployed earlier in the deployment. His squad led the main element up a narrow valley system to the main camp area. While moving to the objective, Sergeant Norton and one of his team leaders were alerted to possible enemy personnel ahead of them along their route and moved forward to assess the situation, while the rest of the platoon halted. While attempting to identify the possible enemy in the valley, a seven to nine man enemy element initiated a complex near ambush on Sergeant Norton's squad from the high ground. The enemy initiated with rocket-propelled grenades and small arms fire from an enemy sentry position only 25 meters to their front. Behind the first enemy rocket-propelled grenade team, a medium machine gun on elevated ground to the northwest engaged them with highly effective fire. Another pair of enemy combatants were on the slope of the valley to the west, engaged the Ranger squad with an AK-47 and rocket-propelled grenades along the long axis of their formation while another group of fighters on elevated terrain to the east raked them with small arms fire from what was effectively the rear of their formation. These multiple enemy positions had effectively enveloped Sergeant Norton's squad from multiple directions at a distance of 25 meters to no more than 50 meters, leaving Sergeant Norton and his element pinned to the floor of the valley kill zone by the intense and accurate small arms fire. The valley itself left no room for maneuver, as it was only 5 meters wide with significant high ground to each side. Sergeant Norton, his squad and the gun team element behind them immediately returned fire, but they were unable to gain fire superiority over the well-established enemy and could not receive effective support from their over watch element or the rest of the platoon due to the restrictive terrain. After the second rocket-propelled grenades knocked two of his Rangers temporarily unconscious and blasted the rest of his squad with shrapnel and debris and realizing his element could not gain fire superiority, Sergeant Norton shouted for his squad to break contact. Sergeant Norton bounded back 15 meters with one of his Rangers, effectively escaping the kill zone, before he realized that two Rangers had not gotten up and were still exposed to the heavy volume of fire from the high ground to the east and west. With complete disregard for his own safety and at great risk to his own life, Sergeant Norton gallantly turned around and with marked distinction, purposefully charged back into the interlocking fire of the enemy ambush kill zone in order to recover his downed Rangers. Without hesitation, he dove down in the midst of enemy fire with his fallen comrades, uncertain of their status. While the rest of the lead element attempted to suppress the enemy, he shouted and shook the downed Rangers until they came to their senses, all the while enemy fires were accurately striking within inches of his position. After reviving his two Rangers, Sergeant Norton led them back to cover through the hail of direct fire and rocket-propelled grenade strikes, saving their lives and bringing his entire squad out of the enemy onslaught intact. While his platoon fought off the enemy ambush with direct fire, mortars, and close air support, Sergeant Norton quickly assessed his casualties and reorganized his squad to return to the fight. Sergeant Norton then continued leading his squad in the follow-on assaults through two more direct fire contacts, killing two enemy fighters. The overall assault force killed 20 enemy fighters, destroyed two enemy anti-aircraft guns and several other weapons, explosives, and military supplies on the objective, thus disrupting a major enemy headquarters and encampment before they could interfere with the approaching Afghan national elections. Sergeant Norton personally saved the lives of two of his Rangers and ensured the success of the mission, leading his squad and the assault force from the front to completion of the mission. Sergeant Norton's distinctive heroism and personal leadership under fire at the risk of his life were well above the call of duty. His actions reflect great credit upon himself, his unit, and the Department of Defense. Michael and his wife, Joanna, have two daughters, Michaela and Lauren.